Hello friends, in this guide, today we are going to share the method of how to download and install latest and trendy AirRec screen recorder for iPhone/iOS 10 without jailbreaking your iOS device. If you love using an advanced recorder, then follow the below guild lines to get this Airrec screen recorder app for iPhone. The Airrec screen app is free for all the iPhone users and you can download it on your device is few simple steps. As you already know the App store has restricted all the screen recorder apps because of its terms and conditions. 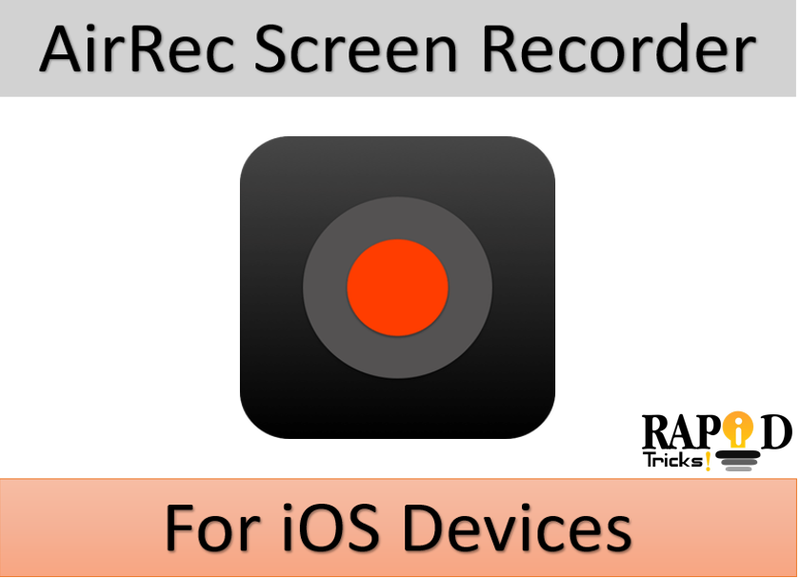 So we have a method for you to download Airrec screen recorder for iPhone or any iOS device. The Airrec screen app is one of the best recording apps. And If you love creating a presentation video, then this iPhone screen recorder app is for you. The Airrec screen recorder will never cause the hanging issue on your iPhone as some of the other screen recording apps does because it is designed and developed with proper compatibility with an iOS device. You can also try some other screen recorders like BB rec, Air Shou, Dr. Fone Screen Recorder and PixelRec etc. These apps are also available for iOS and can be used on any iOS device whether its an iPhone, iPad or iPod. So before learning the easiest method of downloading the Airrec screen recorder, first let’s have a look at some of the best features of Airrec Screen Recorder. Below we have mentioned some best features of the Airrec app so you will understand the functionality of this app. Airrec screen recorder app is a perfect app for screen capturing in video format. It is very easy to download for non-jailbreak iPhone devices. Airrec screen recorder is compatible with all its iPhone/iOS version. It has a clean user interface for all the iOS versions. Additionally, you can add background music to the video after recording. Not only that we can also allocate text to the videos. You have to download Airrec screen recorder iPA file from here on your PC. Then download Cydia impactor on your computer from this link and install the Cydia Impactor. After that launch the Cydia Impactor on your computer and connect your iPhone to the PC by using the USB cable. Now, you have to Select Airrec screen recorder iPA file. Now Drag and Drop it on the Cydia Impactor. Then Cydia impactor will ask your Apple ID credentials. Just enter them and continue the installation steps. Then Airrec screen recorder App is installing on your iPhone. Thereafter, you have to trust the App otherwise it will not work properly. So this is the simple method of downloading AiRec on iPhone or on any other iOS device like iPad or iPod. I hope you find this guide helpful and it resolves your all the queries related to Airec screen Recorder app for iPhone. If you like this article then dont forget to share this article with your friends and help them using screen recorder app for iOS.